Source: Toner Cable Equipment, Inc. The TGT Series 1 GHz multiport, indoor/outdoor taps are the most recent state of the art design, and feature our patented circuit design and surface mount technology. 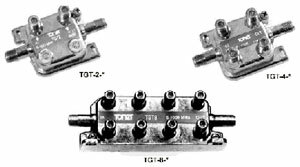 The TGT series are available in 2,4, and 8 port configurations with standard 3 dB tap values for optimum system design. The 2 and 4 port models both use a smaller housing and the 8 port model uses a slightly larger housing allowing the tap to be installed in the tightest of locations. Each housing incorporates integral mounting slots and ground screw for convenience. The taps have "F" ports for input and output and all tap ports. Toner Cable Equipment, Inc., 969 Horsham Rd., Horsham, PA 19044. Tel: 215-675-2053; Fax: 215-675-7543.